Did you miss our last webinar on machine monitoring? Call us at (877) 611-5825 for more demonstrations! 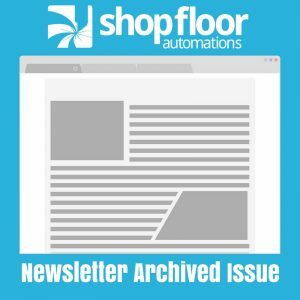 Quickly begin collecting real-time data from the shop floor with no servers to maintain, works with any type of CNC controller or equipment, and access anywhere there is an Internet connection. There is no limit to the number of users, equipment or licenses using our new “cloud-based” machine monitoring software. See our recent tutorials on YouTube to learn valuable information about our solutions and products. The latest tutorial features how to license the Predator CNC Editor Light product which is promoted in our newsletter. We also highlighted the Predator CNC Service showing how to gain valuable, rich data from your CNC controller with Predator Machine Monitoring Software. The Predator CNC Editor free software is perfect for any programmer, hobbyist, or shop floor user to edit, save, print, and modify NC code. The free CNC Editor can be used with any CAD/CAM software to review NC programs before sending them to the shop floor and you can install the application on any number of computers desired. DataXchange from Scytec is our product spotlight this month. Cloud-based monitoring is the way of the future and DataXchange is revolutionizing the way companies can monitor their machines. With mobile applications, you can view and report your data from anywhere. There is a one-time account setup fee and packages start at $45 per month for each CNC.